They’re not as “visible” as the shows, sales and exhibits but there are a lot of different seminars that are offered to people attending Expo. 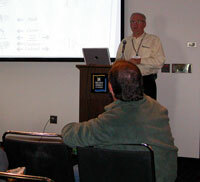 This particular seminar was being held this morning in the Exhibition Hall and put on by Harvestore. As you can see from the schedule there’s lots of flexibility in when you can participate in some of these educational sessions.